2012 Crossroads Rushmore Model M38FL. It is an ideal unit insulated for cold weather camping, with lots of room and equipped for long term stays. See description below. 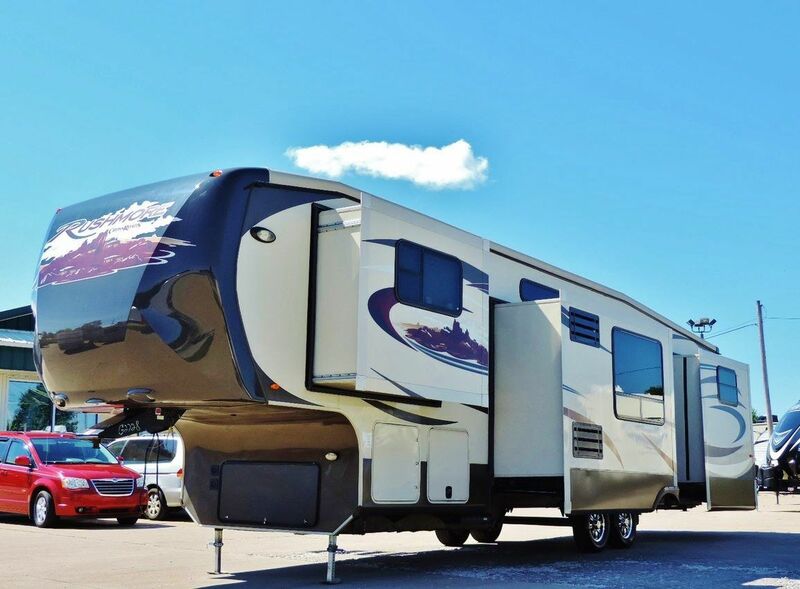 IMPORTANT NOTE: This is a 2012 model unit purchased in 2013, however it has had minimal use, and has very low miles on the trailer since it was purchased. The original owners experienced a family death soon after their purchase and were not able to use it. Description: 2012 Crossroads Rushmore Model M38FL, 5 slides, 40 Ft overall length, 2 AC's 15,000 and 13,500 BTU, 35,000 BTU furnace, power awning, empty Wt 12,150 lbs, and GVWR of 15,500 lbs, 10 gal water heater, outside shower, power jacks front and rear with auto leveling, 50 amp electrical service, with 50 amp surge protector plug. Has been stored high and dry. king bed, 2 leather sofas with pull outs for sleeping, one leather recliner, convection / microwave and regular oven, double door refrigerator with ice maker, fireplace, central vacuum, solid surface countertops, stainless steel sinks, washer and dryer closet with hookups, 3 LCD flat panel TV's.